d'Audretsch Art Gallery, The Hague (1940). F.C. d'Audretsch, Wassenaar and New York. M. Frank, New York (acquired in 1970). Anon. sale, Christie's, New York, 15 November 1989, lot 8 (acquired by the present owner). W. Vanbeselaere, De Hollandsche Period in het werk van Vincent van Gogh, Antwerp, 1937, pp. 263, 353 and 412. J.-B. de la Faille, The Works of Vincent van Gogh: His Paintings and Drawings, Amsterdam, 1970, p. 442, no. F1241 (illustrated). J. Hulsker, The Complete van Gogh: Paintings-Drawings-Sketches, New York, 1977, p. 110, no. 470 (illustrated, p. 111). The depiction of an avenue of trees seen in receding perspective has a long tradition in Northern European painting and was a favorite compositional device in the nineteenth century. It is a simple, moving symbol for the passage of years; the distant horizon may be understood as the threshold of eternity, the great immensity of the future. In March 1884 van Gogh embarked on a series of compositions which depict tree-lined routes (cf. de la Faille, nos. F1129, F1132, F1239, F1130, F1128, F1240 and F1135). 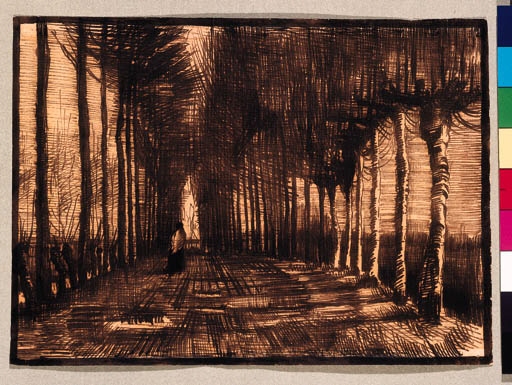 A few weeks previously van Gogh had read poetry by Franois Coppe, including Tristement, about which the painter wrote to Amice Rappard: "[it] reminds me of a Poplar avenue by Hippolyte Boulanger, I think it is called La valle de Josafat. What an autumnal mood it has" (Letters, R41, p. 395). The present work is closely related to another larger drawing titled Poplars (de la Faille, no. F1239; coll. Rijksmuseum van Gogh, Amsterdam), which depicts a man gathering firewood while looking at the viewer. The present drawing has a more haunting, autumnal effect. The canopy of branches and rhythmic progression of tree-trunks enlivens the visual drama of the composition. The figure appears confined within the natural world, traveling along a narrow route, that is perhaps symbolic of life's journey.